Phil Jones has only an "outside chance" of being fit for Manchester United's Champions League last-16 clash against Real Madrid on 5 March. The 20-year-old England international damaged an ankle during Monday's 2-1 FA Cup fifth-round win over Reading. 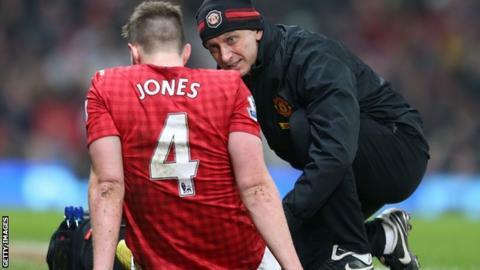 Jones will miss Saturday's Premier League game at Queens Park Rangers. "He has an outside chance for Real Madrid, no more than that," said United manager Sir Alex Ferguson. Jones played in the 1-1 draw in the first leg at the Bernabeu Stadium on 13 February. However, the versatile former Blackburn Rovers defender left Old Trafford on crutches following the Reading tie after a first-half tackle on Jobi McAnuff. Manchester United have not won a Champions League tie this season when Phil Jones has played. He featured in the 1-0 defeat at Galatasaray on 20 November, the 1-0 home defeat by Cluj on 5 December and the 1-1 draw with Real Madrid on 13 February. "He [Jones] is a young man who went into a tackle too brave and was a bit off-balanced," added Ferguson. "We are working very hard, but he certainly won't be fit for the weekend." Premier League leaders United head for QPR, who are bottom of the table, with a 12-point cushion over second-placed Manchester City with 12 games remaining. "The only way we can approach it is by taking care of each game and eventually we run out of matches," added Ferguson, who is chasing the 13th Premier League title of his United reign. "I can understand from Manchester City's point of view why they are talking about us dropping points. "But the fact of the matter is they will drop them as well." Ferguson said he was "surprised" with David Gill's decision to stand down as chief executive in June. "He is still a young man but I understand where he is coming from. Sixteen years in that particular job is not easy."